On Tuesday January 8 the Bureau of Meteorology released an interim special climate statement on the Extreme January heat Australia is currently experiencing. Record temperatures both day-time maximum and night-time minimums continue to be broken. The extraordinary heatwave has also been the scene for catastrophic fires, especially in Tasmania. The Prime Minister Julia Gillard saw the devastation in Dunalley and amoung her many interviews and press conferences made a brief statement connecting the intensity of bushfires with climate change. The Extreme Heatwave had its origins in late December, but seriously started on January 3. It covers an extensive part of the continent mainly affecting inland areas but occasionally impacting the coast. Dr Braganza described it has "It's just an extensive dome of heat over the continent," in a Sydney Morning Herald report. Dr Karl Braganza is Manager of Climate Modelling at the Bureau of Meteorology. The Bureau statement says the spatial extent of the heatwave is highly unusual resulting in many individual station temperatures and national average temperature records being broken, "To date (data up to the 6 January 2013) the national area-average for each of the first 6 days of 2013 has been in the top 20 hottest days on record, with 6 January the fifth hottest on record and the first time 5 consecutive days over 39 °C has ever been recorded for Australia." says the statement. 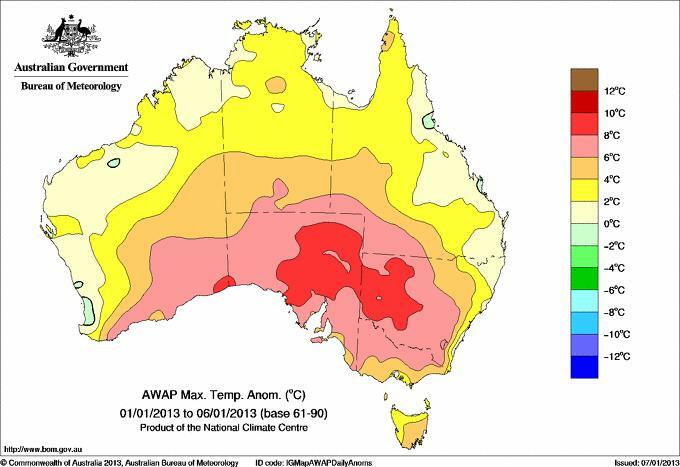 Read Previous article: Extreme Heatwave for Australia January 2013 - bushfire strikes. The last four months of 2012 were abnormally hot across Australia, and particularly so for maximum (day-time) temperatures. For September to December (i.e. the last four months of 2012) the average Australian maximum temperature was the highest on record with a national anomaly of +1.61 °C, slightly ahead of the previous record of 1.60 °C set in 2002 (national records go back to 1910). 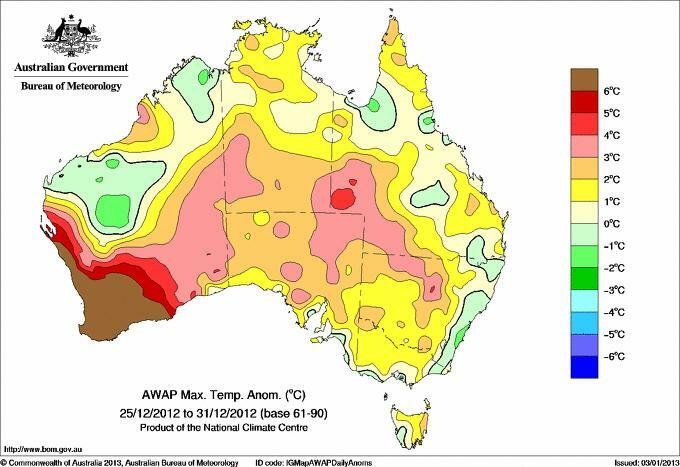 In this context the current heatwave event extends a four month spell of record hot conditions affecting Australia. These hot conditions have been exacerbated by very dry conditions affecting much of Australia since mid 2012 and a delayed start to a weak Australian monsoon. The start of the current heatwave event traces back to late December 2012, and all states and territories have seen unusually hot temperatures with many site records approached or exceeded across southern and central Australia. A full list of records broken at stations with long records (>30 years) is given below. The current heatwave event commenced with a build up of extreme heat in the southwest of Western Australia from 25-30 December 2012 as a high in the Bight and a trough near the west coast directed hot easterly winds over the area. Particularly hot conditions were observed on the 30th, with Cape Naturaliste observing 37.7 °C, its hottest December day in 56 years of record. From 31 December the high pressure system began to shift eastward, bringing well above average temperatures across southern WA between the 30 December and 2 January. Temperatures reached 47.7 °C at Eyre on the 2nd its hottest day in 24 years of record, while Eucla recorded 48.2 °C on the 3rd, its hottest day since records began in 1957. By the 4 January the high pressure system had moved off eastern Australia, with northerly winds directing very hot air into southeast Australia, while southerly winds eased temperatures in WA. Hobart experienced a minimum temperature of 23.4 °C on the 4th (its hottest January night on record), followed by a maximum of 41.8 °C (its hottest maximum temperature on record for any month in 130 years of records) and the highest temperature observed anywhere in southern Tasmania. The area of intense heat moved northeast on the 5th as the high pressure system, now centred over the Tasman Sea, and a low pressure trough directed hot northerly winds into the Riverina and western NSW. Areas affected recorded temperatures well in excess of 40 °C, with Marree in SA recording 48.4 °C, Yarrawonga in VIC recording 45.7 °C and Hay in NSW recording 47.7 °C, breaking its annual daytime temperature record. The area of intense heat lingered over eastern SA and the southern half of NSW until 8 January when the high pressure system in the Tasman Sea began to move eastward. On 8 January, north-westerly winds ahead of a cold front extended the influence of the heatwave to the coast of NSW with temperatures reaching 41 °C in Bega, 42.4 °C in Nowra and 42.4 °C at Sydney Observatory Hill. Western Australia saw a second wave of recording breaking heat on 8-10 January as a second high pressure system moved into the Great Australian Bight directing hot easterly winds in to the state. The highest temperature recorded in WA during this event was 49.0 °C at Leonora, breaking Leonora's previous record of 48.3 °C, set the day before, with temperatures above 45 °C widespread in interior Western Australia. Following two days of cooler conditions in the southeast of Australia intense heat returned on the 11th of January. This second wave of heat reached its peak on the 12th and 13th in the eastern states, with Moomba Airport in SA recording 49.6 °C on the 12th (the highest of the event thus far and the highest temperature in SA outside of January 1960), 48.6 °C at Wanaaring Post Office in NSW on the 12th and 49.0 °C at Birdsville in QLD on the 13th. On the morning of the 14th Bedouri Police Station in QLD recorded an overnight minimum temperature of 34.1 °C the highest of the event thus far and the hottest in Queensland since 34.4 °C on 5 January 2006. Tables 1 to 2 below give a list of all significant daily maximum and minimum temperature records broken during the course of this heatwave event to date. Many stations have also approached but not exceeded historical records including Adelaide (45.0 °C, its fourth warmest day on record). Many stations with shorter periods of observation (i.e., less than 30 years) have also broken records. A particular feature of this heatwave event has been the exceptional spatial extent of high temperatures. Table 3 gives the national and state/territory average maximum temperature for each day of the heatwave event. Australia set a new record for the highest national area-average temperature, recording 40.33 °C and surpassing the previous record set on 21 December 1972 (40.17 °C). To date (data up to the 8 January 2013) the national area-average for each of the first 8 days of 2013 have been in the top 20 hottest days on record, with 8 January the third hottest on record and the first time 7 consecutive days over 39 °C has ever been recorded for Australia. On Monday Australia recorded a new area-averaged mean temperature (average of the maximum and minimum) record of 32.23 °C, surpassing the old record of 31.86 °C set n 21 December 1972. This new record was subsequently broken on 8 January (32.36 °C), making 7-8 January 2013 Australia’s hottest 2-day period on record. David Jones, head of the bureau's climate monitoring and prediction unit, explained "The scale has just been increased today and I would anticipate it is because the forecast coming from the bureau's model is showing temperatures in excess of 50 degrees," he told the Sydney Morning Herald. However, this may be due to one of the modelling predictions according to Aaron Coutts-Smith, the bureau's NSW head of climate monitoring, "The indications are, from the South Australian office, that we are not looking at getting any where near that (50 degree level)." Then again, according to Dr Jones the temperature of the air mass is still warming up. Uh Oh! "The air mass over the inland is still heating up - it hasn't peaked," Dr Jones told the Herald. "And while you would not put any one event down to climate change ... we do know that over time as a result of climate change we are going to see more extreme weather events," she said as reported by Andrew Darby for the Brisbane Times. Indeed we are Prime Minister. Fire weather will worsen with global warming. Certainly we will need to adapt to more frequent and intense fireweather, but we also need to keep working on reducing carbon emissions which is driving climate change. And we need to kick the coal addiction which is one of the major sources of carbon emissions. The Prime Minister spoke to local people who had lost everything and heard several harrowing stories of escape from the intense fire front that roared down and engulfed the town. Many people fled from shore in boats, some had no recourse except to immerse themselves in the water at a pier until the ferocity of the flames had died down. Some good news is that search teams have so far not found any bodies in the burnt wreckage of buildings in the Tasmania fires. Perhaps a good sign that more people have fire plans and are putting them into effect. Julia Gillard also gave a warning to the people of New South Wales. Extreme heat across the state is expected. Sydney is forecast to get up to 43 degrees, slightly shy of the record 45.3 set on January 14 in 1939. Many outback towns in New South Wales and extending over inland areas covering northern Victoria, South Australia, Queensland and Western Australia may see temperatures in the mid to high 40s. Winds gusting up to 80kms/hr are expected in many areas. Lush Vegetation from two years of abundant rain ready to burn after 9 months of drying - tinder dry. Fire weather. NSW Premier Barrie O'Farrellsaid Monday evening "[It] is not just going to be in the 40s. It will perhaps be the worst fire danger the state has ever faced,". A Total fire ban for New South Wales is in force for Tuesday. More than 90 fires are currently burning across the state and at least 20 are uncontained as of Monday. The Fire Commissioner, Greg Mullins, said: "We are expecting extremely dangerous bushfire conditions, the likes of which haven't been seen in NSW for many years. It is 19 years to the day that we saw more than 100 homes destroyed in southern and northern Sydney." Mullins predicted that it "is going to be the worst fire danger day in parts of this state we've ever experienced." A number of factors influences the intensity of fire weather including temperature, humidity, wind speed and direction, dryness in the vegetation and soil and availability of fuel. NSW Fire Media put out the following warning on Facebook for "Catastrophic Fire Danger Tuesday 8 January 2013 for Illawarra, Shoalhaven and Southern Ranges." We are seeing the expected high temps tomorrow 8th January 2013 in the high 40's. With continued hot to very hot, dry and windy conditions ahead of a gusty south to southwesterly change over southern and central New South Wales will result in a Catastrophic to Extreme Fire Danger Rating for most of the southeast of the state, and a Severe Fire Danger Rating for the northwest inland on Tuesday. We urge you to keep an eye on your friends, family and neighbours during the heat, and look out for vulnerable members of your community. Drink plenty of water, and remember to carry some with you when you're out and about. Avoid alcoholic, hot or sugary drinks. Plan your day around the heat. Stay indoors between 11am and 3pm, and minimise physical activity during hot times. If you don't have an air-conditioner, try to spend some time in an air-conditioned place like a shopping centre, library or cinema. Wear light, loose fitting clothing made from natural fibres like cotton. Look after your pets - ensure your pets have plenty of shade and cool water to last the entire day and regularly check on them. Tables from the Special Climate Statement 43 - Extreme January heat - Last update 14 January, 2013 by Climate Information Services, Bureau of Meteorology. (stations with 30 or more years of historical records). Highlighted records (in yellow) indicate the monthly record is also an annual record. *Highlighted records (in yellow) indicate the monthly record is also an annual record. Please refer to Special Climate Statement 43 - Observed records for January heat event (PDF) for tables 3, 4 and 5. Special Climate Statement 43 - Observed records for January heat event (PDF) - Last update 13 January, 2013 by Climate Information Services, Bureau of Meteorology.